The urban programme ‘accommodation with perspective dwelling’ that aims to deal with the so-called ‘refugee crisis’ materialises the city’s understanding of ‘integration’: a new residential area is inserted into an existing neighbourhood with single-family homes, townhouses and a golf course. The flats provide three small bedrooms, two bathrooms and a kitchen, but no living room. They will accommodate either one family or six single refugees. Apart from raising the question whose perspective includes ‘dwelling’ (the refugees’ or the buildings’), the floorplans represent the traditional form ‘nuclear family life style’ (habitat) that is outdated and does not pay justice to current practices of dwelling (habiter). A civil society initiative from the area lobbies for the insertion of a community building into the plan. Due to their colloquial understanding of architecture, they approach the university to ask for a rendering. While the urban programme builds ‘integration’, the initiative seeks to materialise ‘community’. 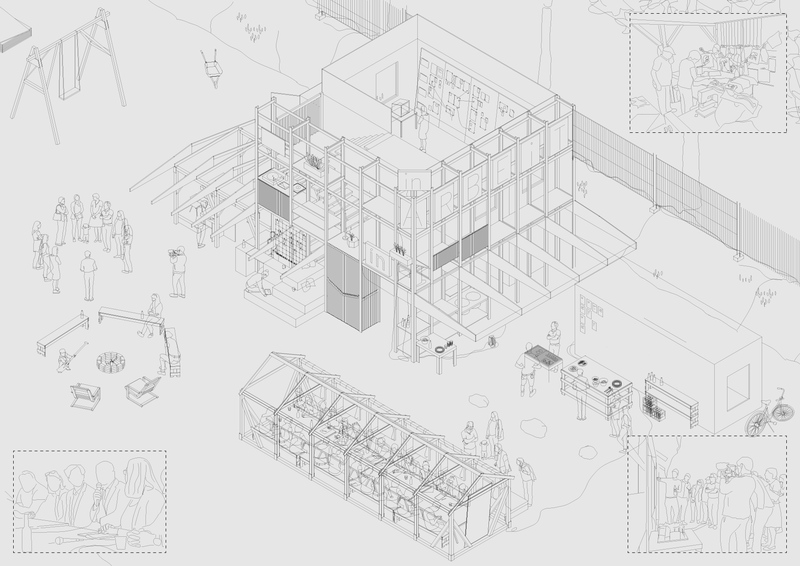 Convinced by the initiative’s claim of planning with not for refugees, the research and teaching programme Urban Design produces process drawings (the speaking base plate) of performed encounters that inform a self-building process. Because neither the city’s accommodation agency planning and building the new blocks of flats nor the initiative understand the drawings, we produce a shiny brochure with references to projects by Aravena, Lacaton&Vassal and Assemble and introduce the idea of the live project: our proposition seeks to integrate research on encounter into the planning, building and programming process. »Building a Proposition for Future Activities« turns into a Summer School engaging international architecture students, new neighbours, trade school students, current neighbours and city representatives with developing a 1:1 model of actual encounters. Shifting the aim of the initiative from the object ‘community building’ to the verb ‘encounter’ and engaging with the existing understanding of ‘integration’, ‘dwelling’ and ‘encounter’, the summer school generates a diagrammatic agency or performative plan. This approach takes issue with the image that projects, represents and communicates a necessarily abstract version of an action-network without questioning the paradigms or even contexts of the kind of activity or usage that refuses representation. The performative plan inscribes action and actual encounter into an epistemological form(at) that makes knowledge performative and thus negotiable.